Located in the former republic of the Soviet Union, Kyrgyzstan, Bishkek is the capital of this now independent state and one of the largest trading and cultural centers of Central Asia. With its population of about one million people, it boasts the benefits of a big city yet still is home to beautiful nature that is carefully kept within city limits. The touches of Kyrgyz history and culture visible around the area add a certain level of charm to this former Russian fortress, which was founded in 1878. Another striking feature of the city is its cosmopolitan character that hosts a multinational population, visitors from many different countries, multinational corporations, and educational institutions. Kyrgyz’ breathtaking nature attracts many foreign tourists who adore mountains, beautiful rivers and lakes, and unspoiled wildlife. 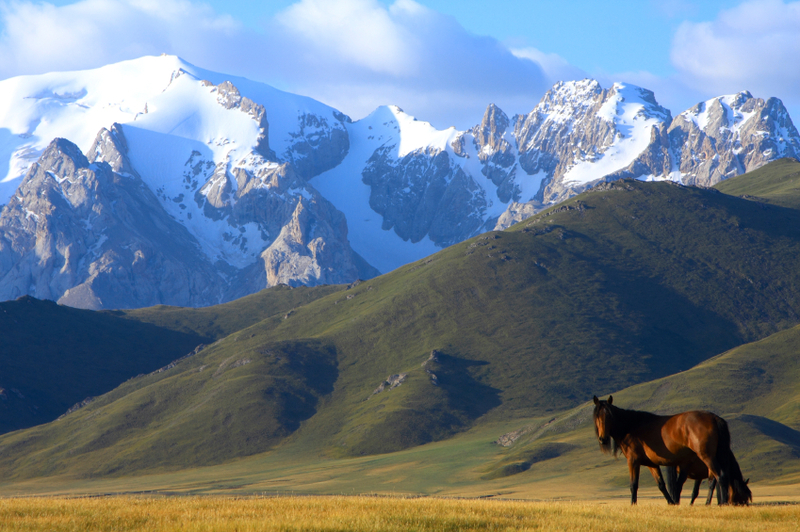 It is also in Kyrgyzstan where the Tien Shan and Pamir mountain ranges are located. Thus, Bishkek is commonly considered one of the most popular mountain getaways in the world. Even while in the city, you can clearly view picturesque hills up to 900 meters high. Quite close to Bishkek, in a very convenient location only 250 km away, lies a great natural wonder, a must-see in Kyrgystan: Lake Issyk-Kul, which is the worlds second-largest and fourth-purest high-altitude lake. All of these unique features cannot help but create pleasant impressions while on vacation or a business trip. Another distinct Bishkek feature is the civil and multinational flavor of the city, with a high tolerance for different cultures and customs. Many Kyrgyz professionals and businessmen concentrate here, as well as immigrants fromRussia, Kazakhstan, the US and various other countries. This helps to make the city a nice, and convenient, place to conduct business. Communication between cultures and countries is supported at the government level as well. Bichkek houses such educational institutions as the American University in Central Asia, Kyrgyz Russian Slavic University, Bishkek Institute of Moscow State University of Economics, Statistics and Informatics,Kyrgyz-Turkish Manas University and even the OSCE Academyin Bishkek. These universities work in accordance with the modern international standards providing their students with the highest level of education and, as a result, turn out highly skilled competitive graduates in different fields including Information Technologies, Computer Science, Economics, etc. The number of graduates is quite impressive (about 50 thousand specialists per year), making the competition tough; however they easily find jobs in various branches of Russian, American, or European companies, or go on to start their own businesses. As for the IT market in Kyrgyzstan, its value is estimated to be $100 million per year according to official sources, with a large share of the software development segment worth about $10 million a year, according to unofficial experts’ opinions. Compared to Russia or India, these figures are probably not as impressive, but it’s a promising start for a young independent state, which is just starting to fight for its position in the international marketplace. A minister from the Kyrgyz government has also announced a firm commitment to create a business park of high technologies in Bishkek. These plans should be expected to come to fruition in the near future given the good background for the fast developing IT market along with various financial reasons such as this: an average salary for programmers, for example, ranges from $500 to $1000 (in April 2011). That being said, challenges should still be discussed. As is the case with any market, the Kyrgyz IT community does experience some fluctuation. Some new startup companies disappear very quickly never to be heard from again, making it unwise to trust them for the outsourcing of software development projects. However, this risk can be avoided by seeking experienced providers with good reputation, especially those with international experience who have their branches in Kyrgyzstan. One of the advantages that such companies enjoy is a visa-free regime, which allows customers and providers to meet without any bureaucratic hurdles. Bishkek’s international airport, Manas, makes this simple by receiving direct flights from London, Moscow, Kiev, Istanbul, Dubai, and many other centers of business activity. International companies also enjoy a number of other benefits in Bishkek. The costs for running a business are quite low here due to the low cost of rent for space, equipment, and infrastructure. Commercial real estate is quite unique in Bishkek. It is not the typical multistoried business centers, seen in other areas of the world. Comfortable enough, yes, but often overcrowded. Here, companies have a choice to rent a spacious and luxurious cottage conveniently located right in the center of the city. This helps to keep accommodations rather economical while still being extremely handy. Sibers, for example, has rented such a cottage for its Bishkek office and enjoys all the benefits it has to offer such as: breakfast on a lush, green lawn; corporate events in the open air; and comfortable rooms for employees and visiting specialists. The beautiful setting with blooming roses in the favorable southern climate makes this area ideal for so many reasons. The setting makes it easy to relate to the atmosphere of The Social Network by David Fincher, when Mark Zuckerberg stays and works at the company headquarters in LA. All in all, Bishkek has come a long way from a provincial Asian town in the Soviet Union. Now, it is proud to be a dynamically developing prospective cosmopolitan center with a good academic background and positively developing economy. Bishkek succeeds at realizing not only its traditionally high trading potential, but also the intellectual power of numerous students, graduates, and professionals, both domestic and foreign. The city offers favorable conditions for business activities, tourism, and entertainment situated in a convenient location at the crossroads of many international routes.